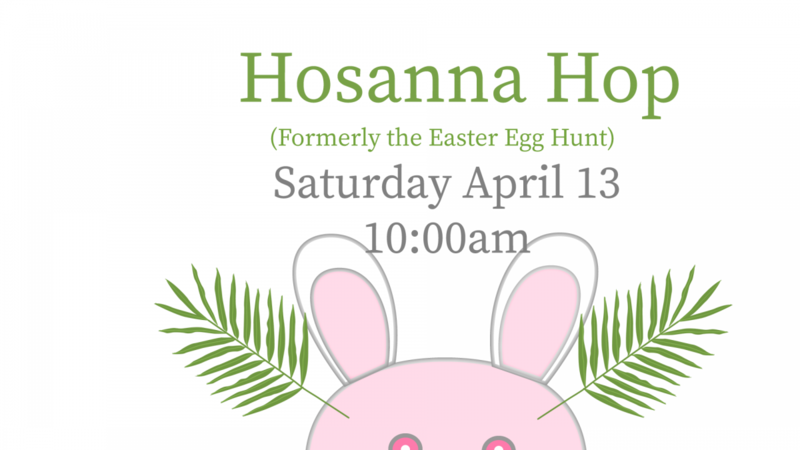 Celebrate the Lent season with the whole family at this year’s Hosanna Hop (formerly the Easter Egg Hunt). This exciting new event will feature food, games, a photo booth, and of course an egg hunt. This is for all ages so we hope to see you and the whole family. Sign Up today. Volunteers Needed! To make this a successful hop 10-12 volunteers are needed. Please sign up here or on Realm. Wish List for Hosanna Hop Dum Dum suckers, Smarties, fun size Skittles, Hershey Kisses, small Tootsie rolls, Easter stickers, tattoos. Please drop off in the bin outside the Sanctuary.